Velvet Poncho – Chic Holiday Party Alternative! What?! More velvet?! YESSSSSS!!!! You know I love a poncho, so how could I say no to a velvet poncho?! Several items I’m wearing were gifts from brands. How are all your holiday preparations coming along, Dolls? I can’t believe Christmas is only two weeks away. My husband and I have both been feeling under the weather, so we eschewed our traditional trek up into the mountains to cut down our own Xmas tree and instead went to the nearest tree lot. We kind of feel guilty like we were cheating, but gosh darn it, it was so much easier. This week I have two holiday parties … our staff celebration which is in the afternoon at school and very casual and my husband’s company party which will be at the Fairmont in downtown San Jose and fancy. Are you all ready for your holiday parties? I know not everyone loves wearing a dress and this type of outfit would be a fun alternative for a holiday event or party, don’t you think? And the poncho is super forgiving if you’ve been overindulging in Christmas cookies! I’m also wearing stretch crepe pants (c/o Lynn Ritchie), reversible tank (c/o Chico’s), Kendra Scott earrings, Donald J. Pliner shoes (c/o). Want more holiday style ideas? Did you see my crushed velvet dress? Make sure you check out my holiday dress picks too! Hope all your holiday preparations are merry and bright! Thanks so much for stopping by! I love everything about this outfit! Those shoes!!! Each time you wear them I drool, and that velvet poncho is FABULOUS! I really love this velvet poncho! It looks so flattering on you. Plus, it is definitely the perfect piece to layer in the cold weather to keep warm. I will totally be checking this out. You are one chic lady! That looks amazing! Side note: I’m wearing a poncho right this very minute! I love ponchos and they are my comfort clothing in the winter! I need another one like that! Heck yes to velvet! Can’t get enough! 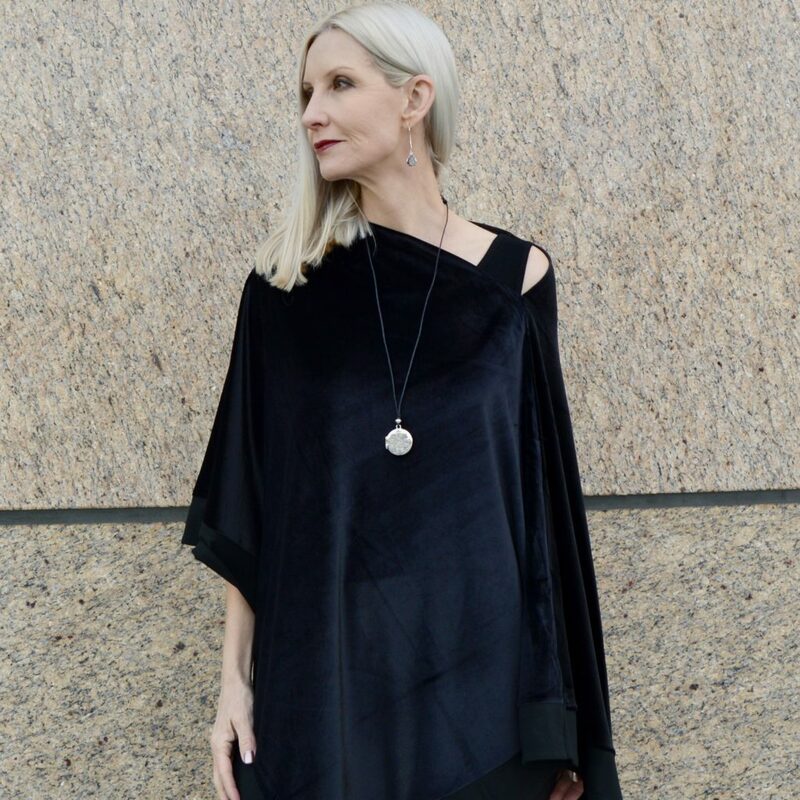 I love this poncho and it’s such a good alternative to wear for a Holiday party! This poncho is gorgeous! Can I just borrow the keys to your closet?? Thank you for sharing for your fab style with the Thursday Moda!